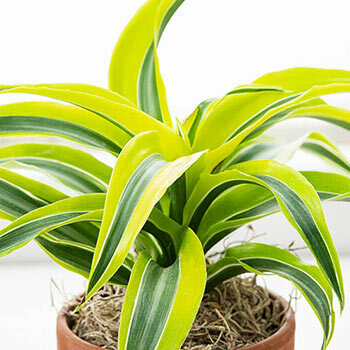 With its bladelike leaves and variegated colors, this houseplant is perfect for bringing a cheery pop of green to even the most shadowy spots in your home. Each long leaf is deep green in color with a lemon trim and an edge of white. All together, the Lemon Surprise Draecena plant can grow up to 3' tall, although you can prune to keep it shorter if you prefer. 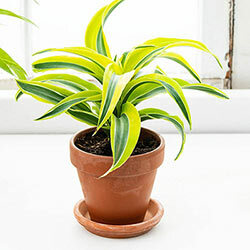 It's incredibly easy to care for—just water it whenever the soil dries out, and make sure not to oversaturate. During the colder months, keep it in an area with a little more indirect sunlight to make up for the shorter days. This will keep it healthy and growing. This is a great gift for apartment dwellers with fewer windows. Finally, they won't need to keep all their plants crowded around the windowsill, they can bring growing, refreshing color further into their aparment. 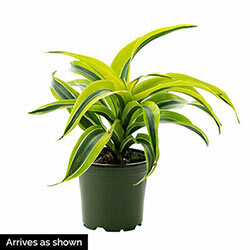 Planting Instructions: Keep the dracaena at soil level when transferring it into a new pot. Re-pot when roots have filled out its current pot. Soil Requirements: Keep the soil damp but do not oversaturate the plant with water. Pruning: Trim brown leaf tips off as they appear. If the dracaena gets too tall, cut anywhere along the central stalk and new growth will appear just below the cutting point. Winter Care: Move to areas with more indirect sunlight to make up for the lack of daylight in the winter. Additional Information: Mildly toxic to pets. Blooms yellow-white flowers on rare occasions.